I have been wanting to try this cake for awhile and decided that Mother’s Day was the perfect day for it. 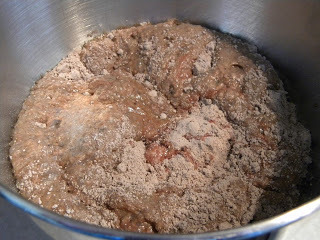 It is super simple, starting with a chocolate cake mix. 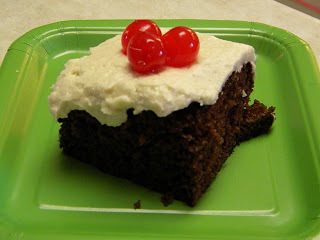 This cake is extremely moist and full of cherry chocolate flavor. Preheat oven to 350 degrees. Spray a 13×9 inch pan with nonstick baking spray. 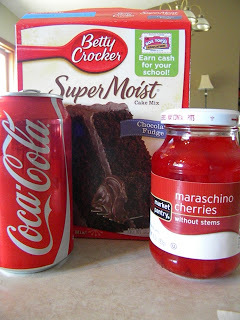 With your mixer, combine cake mix, Coca-Cola, oil, cherry juice, and eggs. Beat at low speed until dry ingredients are moistened. Then beat at medium speed for 2 minutes. Scrape sides of bowl as needed. Pour into pan. Bake for 25-30 minutes or until a wooden pick inserted in the center comes out clean. Cook completely. In a large bowl, beat butter at medium speed until creamy. Add sugar and Coca-Cola, beating until smooth. Spread over the cooled cake. Garnish each piece with cherries. Frankly, I thought the frosting was too sweet. So, next time I think I will just frost it either with regular chocolate frosting or with Cool Whip. But, the cake was delicious and everyone in the family just loved it. I would definitely make it again. This recipe is adapted from Semi-Homemade Magazine.